Waukegan (population 90,788 as of 2008 stats) is located in far northeastern Illinois in east-central Lake County. The Illinois Routes of 21, 41, 43, 131, 132, and 137 all lead you to and from Waukegan. Lake Michigan serves as the eastern border of Waukegan. The Chicago & Northwestern Railroad and the Elgin, Joliet, & Eastern Railroad both travel through the east side of town. Interstate Highway 94 runs by the west side of town. Waukegan sits just 8 miles south of the Wisconsin / Illinois border. "Waukegan, first visited by Pere Marquette in 1673, is one of the oldest communities in Illinois. The city started as a French trading post and Potawatomi Indian settlement known as "Little Fort". Records dating back to 1829 tell of a treaty signed by the Potawatomis in which they ceded all of their land in this area to the Federal Government. Little Fort became the County Seat of Government in 1841 by virture of its population, replacing Libertyville. Between 1844 and 1846, the town's population grew from 150 to 750 people. In 1849 when the town was incorporated, the population had risen to 2,500. Proud of the growth of their community and no longer wanting to be characterized as "little", on March 31, 1849 the residents of Little Fort changed the name of their town to Waukegan, the Potawatomi word for "fort" or "trading post"." Waukegan residents began a school system for their children by the mid to late 1800s. It is likely that high school courses were in place by the late 1800's. Waukegan High School served the town and its ever-growing population through the early 1970's. It was in 1975 that the decision was made to create a second high school in Waukegan. Waukegan High School was renamed Waukegan East High School. The second high school was aptly named Waukegan West High School. Waukegan East High School continued to serve the high school-aged children of Waukegan for the next 15 years. The late 1980's brought about talks of reuniting the two high schools back into one. In 1990 this became a reality. Waukegan East High School was closed. Waukegan West High School resumed being simply called Waukegan High School. 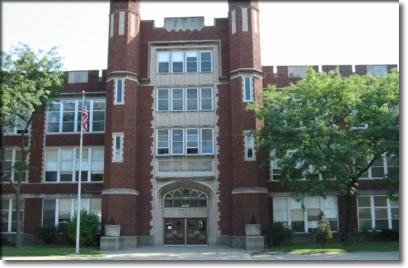 For several years, only ninth graders attended classes in the Waukegan East building, while 10th, 11th, and 12th graders were located at the Waukegan West building. As of the 2009-2010 school year, both buildings (still under one high school system) house 9th-12th grade students. East Campus is now called WHS-Washington Campus (West is called Brookside Campus.) The former 'south building' houses the WHS alternative program. Waukegan East HS team nickname: "Bulldogs"
School Fight Song: "The Purple and Gold"
Though becoming two separate high schools may have cut the number of potential athletes in half for Waukegan East High, this did not result in a let down of athletic successes at the school. Waukegan East had many great teams and athletes succeed in several different sports. You can view this information (team/individual stats and athletes' names) at the IHSA website (www.ihsa.org) Please check it out as several of our class alumni are listed! CHECK OUT THIS VIDEO ABOUT WAUKEGAN! You have to watch this video that was done by a young Waukeganite (Rob Paravonian) and posted on YouTube. It's great to watch, but it is a little sad, and it is definitely sarcastic...but in an amusing way. The description on YouTube states: "A whimsical take on a town that was once the home of Jack Benny and Ray Bradbury." There's an awesome website called "What Do You Remember About Lakehurst?" A lot of folks (maybe even some of our classmates) have posted some of their favorite Lakehurst memories there. It's really great...check it out! W. Belvidere Rd. & S. Waukegan Rd. The second Chicagoland mall designed with input from Victor Gruen was built on a 100 acre parcel, 43 miles northwest of The Loop, in the Lake County suburb of Waukegan. Planning for LAKEHURST MALL got underway in late 1968, when the City of Waukegan annexed a large tract of land to the southwest. Construction began on the bi-level, 1.1 million square foot complex in September 1969. Gruen Associates (by then headquartered in Los Angeles) were assisted by the Chicago-based Sidney H. Morris Associates architectural firm. The developer of the mall, Chicago-based Arthur Rubloff, had built the city's second mall-type center, EVERGREEN PLAZA [January 2008 archive], in 1952. The one hundred store, fully-enclosed LAKEHURST complex officially opened August 19, 1971. It was anchored by a 3-level (226,000 square foot), Chicago-based Carson Pirie Scott, 2-level (187,000 square foot), Chicago-based Wieboldt's and 2-level (240,400 square foot) J.C. Penney. As a supplement, an outparcel Convenience Center was located to the west of the mall proper. It included a Jewel supermarket, Osco Drug and Ace Hardware. The design of the mall also allowed for the addition of a fourth anchor -and new stores- on the south end. However, these were never built. Inline stores in the circa-'71 center included Lytton's apparel, Chess King apparel, Casual Corner apparel, County Seat apparel, Foxmoor apparel, J. Riggings apparel, Richman Brothers apparel, Bakers Shoes, Hickory Farms of Ohio, Hot Shoppes Cafeteria, Singer Sewing Center, Camelot Music and Waldenbooks. By today's standards, the decor of the original mall was very '70s. Loud, gaudy colors, typical of the era, were used profusely throughout the interior...such as red, green, orange and blue. Moreover, the Center Court featured a circular fountain and glittering, chrome mobile, suspended from the ceiling. The nearest retail rival was BELVIDERE MALL (1965), also in Waukegan. It was dwarfed by the sheer size of LAKEHURST, but in the end, survived long enough to eclipse its larger counterpart. Lakehurst Cinema opened -as a tri-plex outparcel- in 1974. It became a 5-plex in 1984 and a 12-plex in 2004. The theatre complex was demolished in August 2007, with a Holiday Inn Express taking its place. A facelift renovation was done to LAKEHURST in 1979, with the early '70s motif replaced by a more muted, earthtone color palette. Oddly enough, a Food Court was not installed in the mall then or at any time in the future. The overmalling of the Chicago metropolis began to catch up with LAKEHURST in the 1980s. This downturn in the fortunes of the mall was furthered by the shuttering of Wieboldt's in August 1986. After a brief stint as a temporary elementary school, the lower level of the building was sectioned into seven smaller retail spaces. The upper level became a Montgomery Ward. The completion of GURNEE MILLS (1991), in Gurnee, signalled the beginning of the end. Early in the decade, the retail roster at LAKEHURST included one hundred tenants. By 1997, this was down to fifty. In the year 2000, a mere five stores were still in business. J.C. Penney and Wards had called it quits in 1998. On January 31, 2001, LAKEHURST MALL officially closed. The Carson's store remained in business until January 14, 2004. The mall's demolition had actually begun the previous November. By May 2004, the once-mighty shopping venue was completely leveled. As one might expect, the mall was replaced by a new Wal-Mart Supercenter. The 204,000 square foot store opened in April 2006, as a part of a redevelopment of the site known as FOUNTAIN SQUARE AT WAUKEGAN.